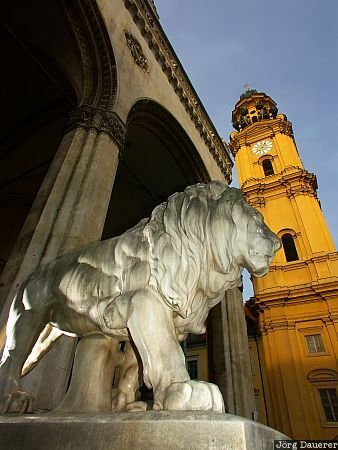 Theatinerkirche (church of St. Kajetan) and a Lion of the Feldherrnhalle in the foreground partially illuminated by a flash gun (used as a fill flash) in downtown Munich, the capital of Bavaria, in southern Germany. This photo was taken early in the morning of a sunny day in September of 2004. This photo is part of the exhibition Fill Flash (June 2016). This photo was taken with a digital camera.